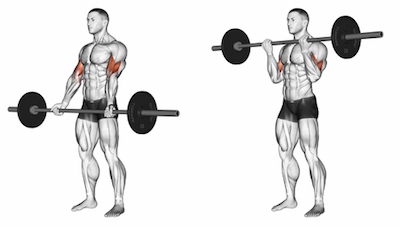 Take an underhand grip on a barbell, just outside of shoulder-width. Your feet should be planted firmly, knees bent slightly. Your core is tight and your torso straight. Your arms hang down outstretched toward to the floor taking the weight of the barbell. This is the starting position. Commence the movement by curling the bar up from the elbow joint and squeezing your biceps. The elbows should be pinned to your side and work like a hinge while you exhale through the movement. Do not use momentum to throw the bar up. The torso should remain stationary. When your biceps are at maximum contraction and the bar approaches your upper chest, squeeze for a second and then reverse the movement by extending the arms to the starting position, inhaling as you do.